Convicted Indonesian Islamic cleric Abu Bakar Bashir (center), and presidential adviser Yusril Ihza Mahendra (right), speak to reporters at Gunung Sindur Prison in West Java, Jan. 18, 2019. An elderly Muslim cleric jailed on terrorism charges and linked to the 2002 Bali bombings will be released only if he pledges allegiance to the state and its founding ideology, Indonesian President Joko “Jokowi” Widodo said Tuesday. 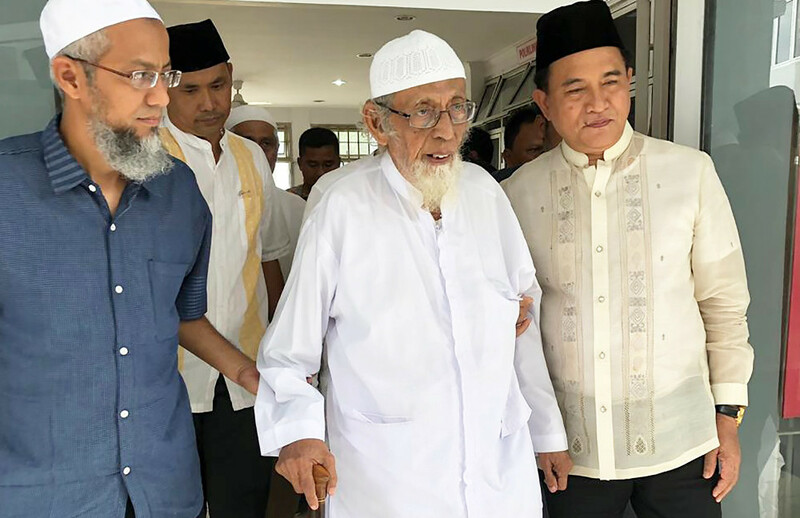 Jokowi’s remarks appeared to contradict a statement by his legal adviser last week that preacher Abu Bakar Bashir, 80, who is serving a 15-year prison term, would be released unconditionally on humanitarian grounds due to his age and poor health. “There are legal procedures that we have to go through. This is a conditional release, not an unconditional one,” Jokowi told reporters at the presidential palace in Jakarta. “The conditions must be fulfilled, including a pledge of allegiance to the Unitary State of Indonesia and Pancasila,” Jokowi said, referring to the state’s philosophy, which espouses a belief in one God, humanity, unity, pluralism and social justice. Bashir was jailed after his 2010 arrest and sentenced in 2011 to 15 years on charges that he helped fund a training camp for Islamic militants in Aceh province and incited extremists to carry out terrorist attacks. Previously, he was arrested after the Bali bombings, but prosecutors could not link him to the attack and a Jakarta court found him guilty of falsifying documents and sentenced him to 18 months in prison. On Monday, Indonesian security minister Wiranto said the president had “ordered relevant officials to immediately conduct a deeper and comprehensive review to respond to the request” that Bashir be released from prison. The government’s apparent about-face came after Indonesians, including Jokowi supporters, took to social media to express opposition to Bashir’s release. In addition, Australian Prime Minister Scott Morrison urged Jokowi to show respect for his country, noting that 88 Australian citizens died in the Bali attack, which killed 202 people. Bashir co-founded Jemaah Islamiyah, a regional militant group associated with al-Qaeda that was blamed for the bombing. A political analyst said Jokowi, who is seeking a second term as president in the April 17 election, made a politically calculated decision because Bashir commanded support among conservative Muslims. Opponent Prabowo Subianto, a former general who lost to Jokowi in 2014, has a checkered human rights record but has cultivated ties with conservative Muslim groups. Jokowi legal adviser Yusril Ihza Mahendra, who on Friday announced the release, has said that Bashir refused to sign the pledge of allegiance because he believed his loyalty was to God and Islam only. Yusril said Jokowi could bypass the requirements on humanitarian grounds, and Bashir had agreed that Pancasila was consistent with Islamic teachings. Meanwhile, lawyer Achmad Michdan told BenarNews that Bashir’s love for country should not be doubted. “Being loyal to one’s country is part of Islamic teachings,” Michdan said of his client. Another Bashir lawyer, Muhammad Mahendradatta, told Indonesian media he had expected his client to be released on Wednesday. In Surakarta in Central Java, preparations have been under way to welcome Bashir home. Tents have been erected outside the Al-Mukmin Islamic boarding school founded by the cleric. “It looks like we’ve been given false hope,” said Endro Sudarsono, a supporter and former teacher at Al-Mukmin. “Invitations have been sent and we will still come,” he said. Thayep Malik, a counter-terrorism researcher at the Prasasti Perdamaian Foundation, an Indonesian NGO, said Bashir’s release had been anticipated by his supporters. “If he’s not freed, there will be more hostilities against the state,” he warned. Despite her harsh comments about the decision, Jones said Bashir’s release was unlikely to suddenly increase the risk of terrorism in Indonesia and does not signal a reduction in Indonesia’s counter-terror efforts. Another analyst expressed concerns about Bashir’s reach. Sri Yunanto, a lecturer at the School of Strategic and Global Studies at the University of Indonesia, said Bashir needs to sign the loyalty pledge because he wrote a book attacking Pancasila. “Abu Bakar Bashir is not alone, there are many [followers] behind him. He should be monitored by the police because after all his influence is still strong, “he added. Kusumasari Ayuningtyas in Surakarta and Ahmad Syamsudin in Jakarta contributed to this report.